The Dali University Tea Plantation, painted with Matcha from Kunming. Yunnan is famous for tea production, especially pu’er, and I was absolutely thrilled to learn we were visiting a tea plantation in class. We drove an hour along the shore of lake Erhai to the Dali to the Dali University Tea Plantation, up in the foothills of the Cangshan mountains. 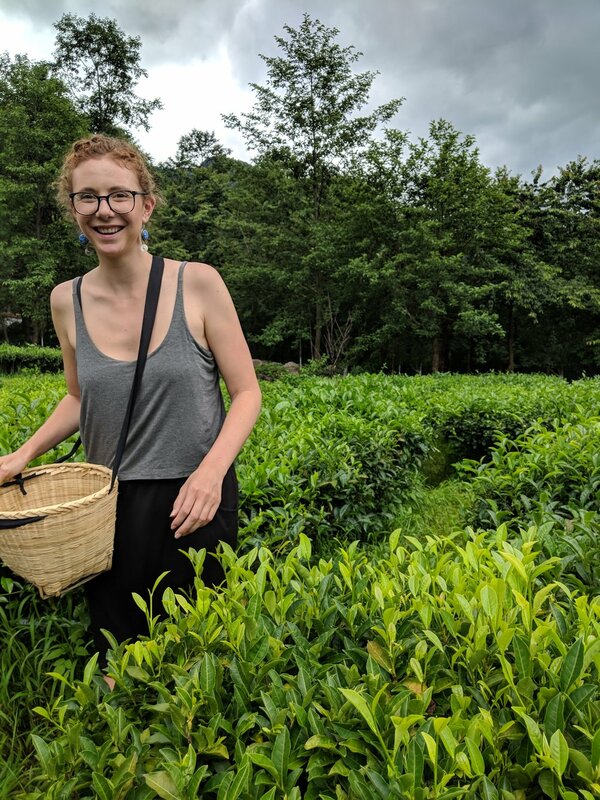 The tea plantation doubles as a visitor and education center, and we got to pick our own tea leaves and learn about the preparation of different types of tea first-hand. All tea is made from the same plant, Camellia Sinensis. The difference is in the treatment after picking. We spent an hour picking the tender small leaves in the plantation. The most valuable leaves are the ones that are still furled (especially for white tea, which is what we were harvesting tea for.) White tea is dried and sometimes lightly roasted. It has more buds than another teas and a light flavor. Green tea, in contrast, is steamed or pan fired after harvesting to prevent oxidization and keep the fresh-picked flavor. Yunnan is famous for its pu’er, a type of black tea. Black tea (called red tea in China) is allowed to oxidize. They dry the leaves, then oxidize them in controlled temperature and humidity rooms. The leaves are then dried again to stop the oxidization process. Pu'er tea is then pressed into blocks. Raw pu'er continues oxidizing over time and gets better with age. Cooked pu'er doesn't continue fermenting. Blocks of tea that get better with age were ideal for trade along the Ancient Tea Horse Road, which went through this area. Learning more about the process of producing tea made me understand the often high prices- picking enough tea for a single cup took me about an hour, without all the added labor of drying and processing.